All three yurts are well insulated with pine floors and have futons with thick foam mattresses for a great nights sleep. They all have electricity in them with a panel heater, fridge and kettle. Snuggle up in bed in your yurt and stargaze from the comfort of your bed through the central dome in the roof. Unfortunately, dogs are not allowed in any of the yurts. 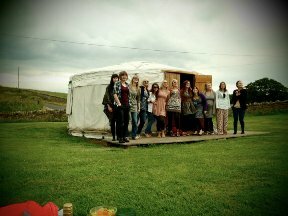 Two of our yurts sleep 4 people and the larger yurt can sleep up to six people.